"Hole-in-the-Ground: Remote, Secluded - Intriguing!" Welcome to Hole-in-the-Ground, where you will notice one of the most peculiar geological formations in the region. 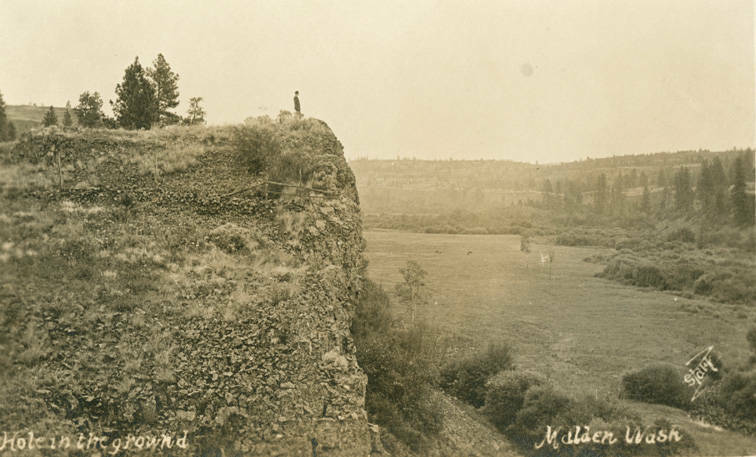 As part of the channeled scablands, Hole-in-the-Ground was created by the powerful flood waters of glacial Lake Missoula some 15,000 years ago. The torrents carved coulees, valleys and gorges through the basalt rock of the region, leaving behind the immense walls surrounding enormous trenches. But these geological formation of the region can also be explained in another way. According to Palus tribal legend, Hole-in-the-Ground was the home of Beaver during the "time of the Animal People." Armed with spears, the five Wolf Brothers ambushed Beaver as he resided peacefully at his lodge. An epic battle ensued, which consequently formed the curious geography of Southeast Washington. 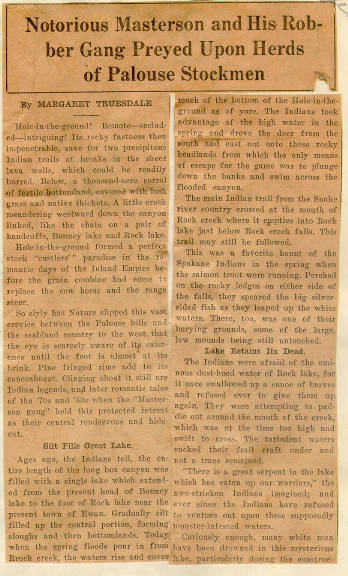 During the fight, Beaver ripped and "chewed-out" nearby Rock Lake and as he clawed his way towards the Snake River Valley, his beating tail created the various small waterfalls along the Palouse River. Beaver was eventually killed by the Wolf Brothers and, in the throes of death, he carved-out the sheer cliffs of Palouse Falls. 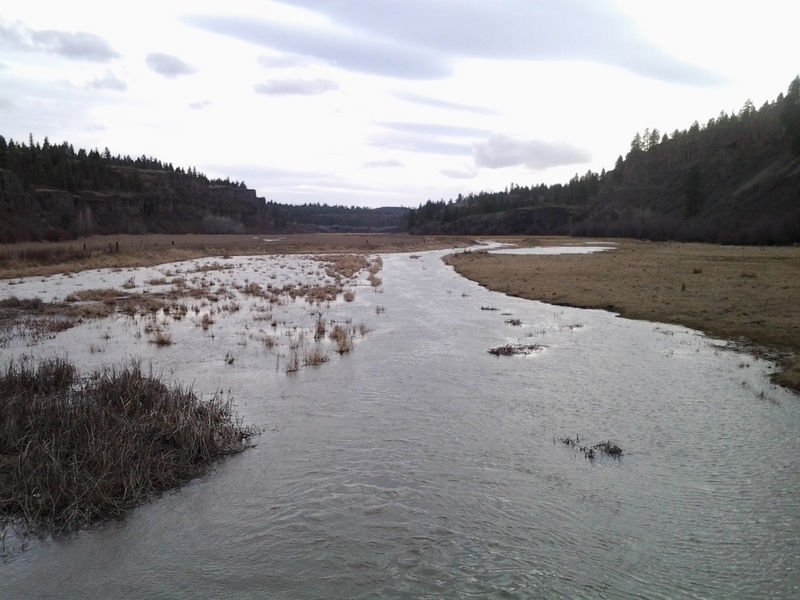 Beaver's heart turned to stone as the giant creature collapsed at the confluence of the Snake and Palouse rivers. His remains were transformed into the region's various tribes, but the Palus were said to have "sprung from his heart." For the Palus, Hole-in-the-Ground is not just an interesting sight to behold, it is at the forefront of creation. The natural barriers provided by the massive stone walls, along with the fertile, 1,000 acre valley below, makes for a great livestock and horse corral, especially for the region's cattle rustlers. In the 1870s and 1880s, the Masterson Gang, a notorious group of rustlers and thieves led by "Big Bill" Masterson, used Hole-in-the-Ground as their main rendezvous point and corral. The gang raided ranches as far as Montana and Oregon, bringing back as much as 500 horses in a single trip. The herds were rested here, grazing in the lush grassland valley for a few days before they were driven again to be sold - and always at a profit. Sometimes, the herds were sold back to the same ranchers the gang stole them from. The gang was eventually foiled by Hole-in-the-Ground homesteaders Henry Jones and Luke Rawls. Rawls, who was deputized, successfully infiltrated the gang and with the aid of Jones, was able to arrest Masterson in the Spokane Valley after returning from a trip to "fetch some horses" in Montana. 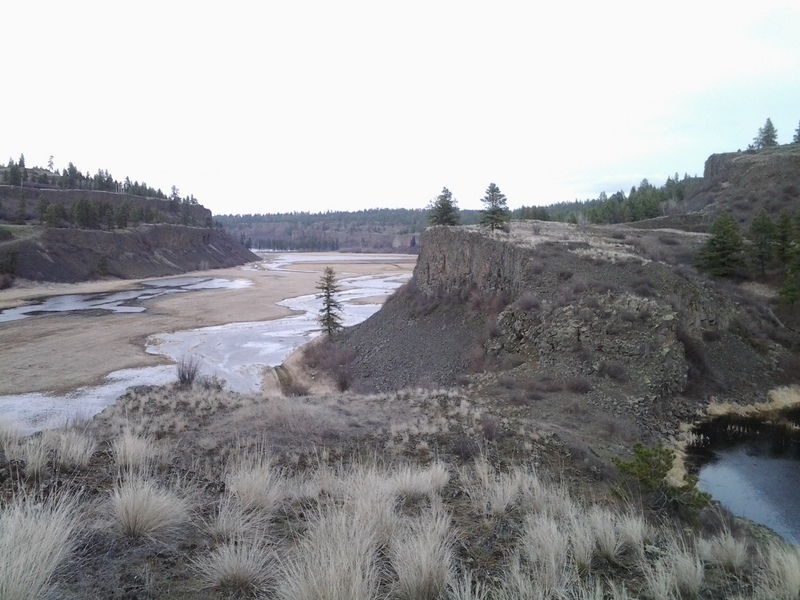 Hole-in-the-Ground Looking Northeast, 2014.: Looking at Pine Creek as the spring runoff first begins to flood the valley. This will produce a lush green pasture by the early summer. Image courtesy of author. 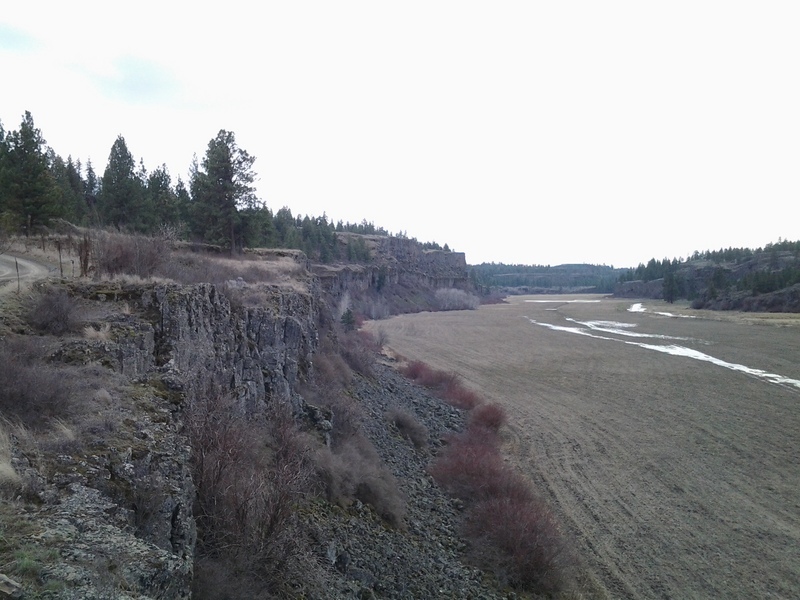 Hole-in-the-Ground, looking Northeast, 2014.: A view from atop the cliffs above Hole-in-the-Ground. Pine Creek floods the valley below. Image courtesy of author. Hole-in-the-Ground, looking West, 2014.: A view from the northwest side of Hole-in-the-Ground. Rocky cliffs like this line the entire perimeter of the entire formation. Image courtesy of author. Robert M. Lambeth, “"Hole-in-the-Ground: Remote, Secluded - Intriguing! 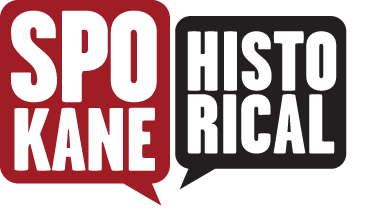 ",” Spokane Historical, accessed April 20, 2019, https://spokanehistorical.org/items/show/424. 1. Richard Scheuerman and Michael O. Finley. Finding Chief Kamiakin: The Life and Legacy of a Northwest Patriot (Pullman, WA: Washington State University Press, 2008), 13, 14. 2. Richard Scheuerman and John Clement. Palouse Country: A Land and its People (Walla Walla, WA: Color Press, 2003), 26, 27. 3. Margaret Truesdale. "Notorious Masterson and His Robber Gang Preyed Upon Herd of Palouse Stockmen." Grand Coulee Journal. September 20, 1935.